A real challenger, the dynamism of the NEHÔ Group and its sense of service linked to a reactivity and an acute sense of values make the attractiveness of our group in constant evolution since its creation. NEHÔ-GROUP has been in active gestation for more than two years and was legally created in 2014. The objective is to have 35 to 40 hotels by the end of 2019 with an objective turnover of more than 100,000 million euros. Our ambition is to be able, with you, to imagine and create the hotel business of tomorrow today. To succeed we base our success on the complementarity of our businesses but also on ambitious and geographically close projects to enable us to manage and run as well as possible the establishments all located in first-rate tourist areas. 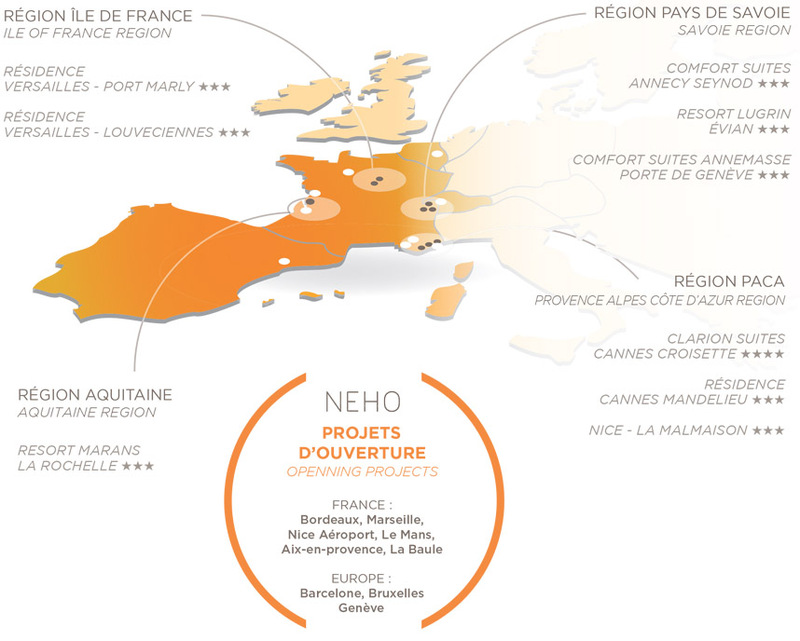 Historical cradle of NEHÔ-GROUP, the Provence-Alpes-Côte-d’Azur region has always been a tourist must and the figures show that the years to come will not deny the affection of tourists for this region. Our group will be present with recovery and hotel creation projects in many cities in the PACA region. Regions with strong potential such as the Ile de France, the Lake Geneva Basin, the Great West are also targeted in priority.